Produktinformationen "AVENGERS INFINITY WAR LEGENDS 15 cm ANT-MAN ACTIONFIGUR"
From Hasbro Toy. With the Marvel Legends Series, both kid and adult Marvel fans can start a legendary collection of comic- and movie-based Marvel characters! These 6-inch figures are highly articulated and feature comic-inspired designs, making it another worthy addition to the Marvel Legends Series! Collect all figures in this AvengersMarvel Legends Series Build-a-Figure collection to assemble Cull Obsidian! Collect Black Knight, Thor, Black Widow, Ant-Man, Wasp and Malekith. 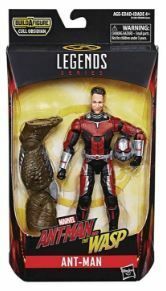 Weiterführende Links zu "AVENGERS INFINITY WAR LEGENDS 15 cm ANT-MAN ACTIONFIGUR"
Kundenbewertungen für "AVENGERS INFINITY WAR LEGENDS 15 cm ANT-MAN ACTIONFIGUR"